His Royal Highness the Duke of Kent witnessed first-hand the courage of patients who are enduring the long-term impact of serious burn injuries during a visit to Stoke Mandeville Hospital on the 2 June 2015. 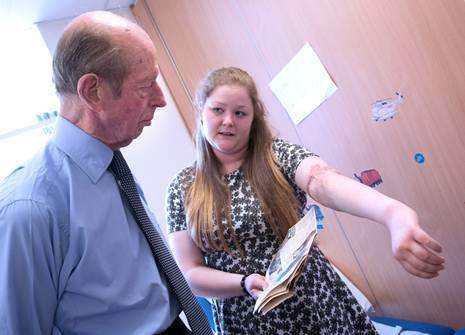 The Duke, who was invited in his capacity as Patron of the Restore Burns and Wound Research charity, met children and adult patients who are recovering from burns, along with the staff supporting them through the often lengthy process of treatment and rehabilitation. Stoke Mandeville Hospital is home to a regional burns unit which ensures that patients suffering the effects of serious burns receive a package of care. This involves reconstructive surgery, but also support from dedicated occupational therapists, psychologists and physiotherapists. Amongst the patients the Duke met were Slavica Mileva, a 30-year-old woman badly burned in a car accident last year; 20-year-old Monica Garcia Machuca, who last month was seriously injured after a laptop she had on her knee burst into flames; and Chloe Higgs, a 15-year-old girl still receiving treatment for scars she endured from a kettle burn as a toddler. Chloe, from Aylesbury, first met the Duke 12 years ago, during a previous visit he made to the hospital, and showed him a press cutting she has kept from the day (Pictured). “It is fantastic that the Duke has taken time to visit us once again at Stoke Mandeville Hospital. His commitment helps us to highlight the journey that our patients undertake, and the burden that scarring from burns places upon them for the rest of their lives. After the tour of the hospital, the Duke was given the opportunity to learn about the upcoming plans for Restore; the charity founded in 1991 to fund research on burns and reconstructive surgery. The charity has close links with Buckinghamshire Healthcare NHS Trust, and is currently funding research into advancing burn and scar treatment in the Burns Unit at Stoke Mandeville.